Located just a few minutes’ drive from Downtown Palm Springs and some of Southern California’s best golf greens, Palm Canyon Resort and Spa features a five-star location with equally wonderful accommodations and amenities. Spacious, luxurious rooms are accompanied by enormous pools with slides and children’s play areas, a game room with pool table, a steamy sauna as well as a world-class spa, and much, much more. Relax poolside with a delicious hand-crafted drink at the bar while the kids thoroughly enjoy the slides and waterfalls; take a short drive to Downtown Palm Springs for a lucky glimpse of celebrity personalities- Palm Springs is called “Hollywood’s Hideaway” for good reason!- or to experience the best in shopping, dining, drinking, theaters, art, and more! Stop by the botanical gardens and Indian Canyons for gorgeous natural vistas, take the family out to Wet N’ Wild waterpark for the day, check out the infamous Walk of Stars for some celebrity history, or head out to one of the amazing nearby golf courses or casinos with your better half for a night and day of nonstop fun. 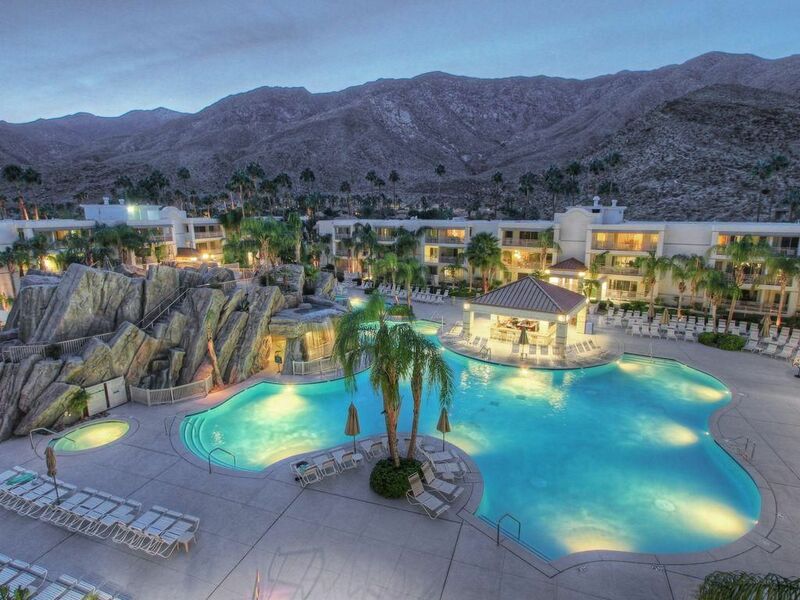 Whether you’re looking for a fun-filled family getaway surrounded by luxurious accommodations, a relaxing couple’s retreat into a desert oasis, or a rejuvenating solo trip of Hollywood history, hot springs, and gorgeous natural vistas, look no further than Palm Canyon Resort. We are the official and exclusive partner for Diamond Resorts. Only rent from official listings in order to ensure your reservation gets delivered to the resort and you receive the best possible guest experience at our properties. Book online now for instant confirmation. Tucked into the eclectic and exciting town of Palm Springs, Southern California, Palm Canyon Resort offers the best in natural landscapes and outdoors activities, charming Hollywood-esque town-life, and exciting attractions such as waterparks for the kids, casinos and nightlife for the adults, and wildlife preserves and zoos for the wonder and amazement of every age. Try the aerial tram to Mt. San Jacinto for stunning summit views or hike and bike through the surrounding desert landscapes, resplendent with invigorating sunshine, whimsical wildlife, and vaulted sapphire skies. Head over to the Magic Jungle Wildlife Preserve to see tigers, leopards, and cougars up close. Not feeling that adventurous? Enjoy a relaxing day of golf on one of the nearby courses or head into Downtown Palm Springs for delicious wining and dining, wonderful shopping, a night out on the bar scene, or a little bit of starstruck sightseeing. This scenic-inspired Two Bedroom Villa is extremely spacious and can accommodate up to six guests. The Master Bedroom features a plush king-sized bed as well as a flat-screen TV and private acess to the full bathroom replete with a luxurious jetted tub and shower combination. The Guest Bedroom is similarly equipped with a flat-screen TV along with a cozy queen. Enjoy a homemade meal courtesy of the fully-equipped kitchen- contains stove, oven, fridge, microwave, toaster, coffee maker, utensils, cookware, dishes, and dishwasher- aroudn the elegantly-set dining table. After dinner, feel free to head over to your comfortable living area for a late-night movie on the flat-screen TV (equipped with DVD Player). Before heading in for the night, take a moment to step out onto your deck and appreciate the gorgeous, twinkling stars in the desert night sky. Featuring amazing accommodations and even better amenities, Palm Canyon Resort & Spa has everything you need for the perfect California vacation. Enormous, aquamarine pools fitted with waterslides, coves, and hot tubs; poolside bars and patio dining; an adult lounge and billiards table; air-conditioned indoor volleyball and basketball courts- guests are invited to enjoy all this and much more. The world-class spa offers mind-numbingly wonderful massages which range from in technique from Deep Tissue to Swedish Therapeutic as well as facials, scrubs, wraps, and more. Take a relaxing dip in the simmering hot tub, stop by the state-of-the-art fitness center for a rejuvenating workout, enjoy a delicious snack at the poolside bar, or grab the family and head out onto the lushly tropical grounds for a midday picnic overlooking the gorgeous mountains and desert scenery. Stop by the Activities desk for a family adventure, or enjoy an afternoon Yoga session in the summery sun. No matter your age, no matter your companions, Palm Canyon Resort & Spa will help you make the most out of your stay in Palm Springs. An easy Uber to all the shops and dining in downtown. Hiking and golf out our door, what more could you ask for? The pool is awesome, heated, and the bar is convenient. Our villa was perfect. The staff was very courteous and helpful. Everything was absolutely clean and tidy, can’t wait to go back next winter! Spacious Unit - cool and clean. Facilities were great! Kid's loved the room we stayed in. It was spacious and AC worked well. Elevators were old and small. Parking was also farther if you have a tall vehicle. Check in was at 4PM and it was long because of the construction going on. Staff was pleasant and respectful. For slides at the pool to close at 5PM, that was not fair. You barely check in and don't have time for kids to enjoy the slides. (NOTE: they did keep the slides open until 7PM this day and that was so nice of the facility.) Gym was a nice feature. Had a half court basketball in it. Gym was decent size. The property is not in very good shape. old cabinets, appliances, and paint. Looks like when they fixed things they went with the cheapest solution instead of making things right. staff was not very knowledgeable. Air conditioning was not very cold in multiple rooms. Trash was left in hallways all day even though housekeeping had been through the floor. You would think that some staff would pick up trash that people had left by the elevator. Waited all day to get my room moved and then it never happened. The one redeeming aspect of the property is they have a great pool. The apartment was beautiful and very clean, the views were of the mountains and just gorgeous. The wait to check in was lengthy, and the reception forgot to use the pager they gave us but we sat by the pool, which was very cloudy - you could not see the bottom. However all in all a very pleasant stay and I would recommend for anyone wishing to visit Palm Springs! __________________________ OTHER THINGS TO KNOW __________________________ - All Guest Suites are Non-Smoking - Photo ID is required to check-in - Minimum Age Requirement for Check In is 21 - Pets not permitted with the exception of Service Animals - One vehicle per accommodation may be parked on property. Additional vehicles must be parked off-site. All garages have a maximum height of 6 ft.; SUVs, vans, and high-profile vehicles are required to use perimeter parking - We encourage you to reserve your Day Spa appointments prior to arrival. TAXES & FEES - Security Deposit of $100 (cash not an acceptable form of deposit) - Nightly Resort Fee of $29.95* pre taxed will be required at check-in Resort Fee* includes access to underground parking, pools, sauna and waterslides, fitness center, billiards, sport court, business center computer/internet, and boarding pass printing This property charges a mandatory resort fee due at check-in. Please check listings for details. Rates subject to change. Click "Book it Now" for rates and availability. Reservations may be cancelled up to 8 days prior to arrival. A cancellation fee of 25% of the reservation will be charged. Cancellation requests made 7 days or less prior to arrival are non-refundable.